Now retired, Ernst Lueder was Professor at the Department of Electrical Communications and Director of the Institute of Network and Systems Theory at Stuttgart University until 1999. He also headed a research laboratory for the fabrication of flat panel displays. Professor Lueder is a Fellow of SID, and is also an IEEE Fellow. He has been awarded the order of merit 1st Class of the Federal Republic of Germany. 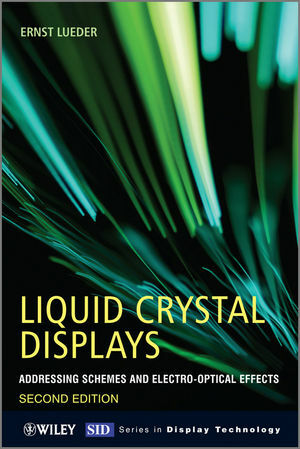 Since his retirement, he has written the first edition of Liquid Crystal Displays: Addressing Schemes and Electro-Optical Effects (Wiley, Mar 2001). He has also authored Bau Hybrider Mikroschaltungen (Springer-Verlag, 1977) and written over 200 papers on LCDs, network systems and theory and thin film sensors. 2 Liquid Crystal Materials and Liquid Crystal Cells. 2.1 Properties of Liquid Crystals. 2.2 The Operation of a Twisted Nematic LCD. 3 Electro-optic Effects in Untwisted Nematic Liquid Crystals. 3.1 The Planar and Harmonic Wave of Light. 3.2 Propagation of Polarized Light in Birefringent Untwisted Nematic Liquid Crystal Cells. 4 Electro-optic Effects in Twisted Nematic Liquid Crystals. 4.1 The Propagation of Polarized Light in Twisted Nematic Liquid Crystal Cells. 4.2 The Various Types of TN Cells. 4.3 Electronically Controlled Birefringence for the Generation of Colour. 5.1 The Characterizations of Polarization. 5.2 A Differential Equation for the Propagation of Polarized Light through Anisotropic Media. 5.3 Special Cases for Propagation of Light. 6 Propagation of Light with an Arbitrary Incident Angle through Anisotropic Media. 6.1 Basic Equations for the Propagation of Light. 6.2 Enhancement of the Performance of LC Cells. 6.3 Electro-optic Effects with Wide Viewing Angle. 6.4 Multidomain VA Cells, Especially for TV. 6.5 Polarizers with Increased Luminous Output. 7 Modified Nematic Liquid Crystal Displays. 7.1 Polymer Dispersed LCDs (PDLCDs). 8 Bistable Liquid Crystal Displays. 8.1 Ferroelectric Liquid Crystal Displays (FLCDs). 8.2 Chiral Nematic Liquid Crystal Displays. 8.3 Bistable Nematic Liquid Crystal Displays. 9 Continuously Light Modulating Ferroelectric Displays. 9.1 Deformed Helix Ferroelectric Devices. 10 Addressing Schemes for Liquid Crystal Displays. 12 Passive Matrix Addressing of TN Displays. 12.1 The Basic Addressing Scheme and the Law of Alt and Pleshko. 12.2 Implementation of PM Addressing. 12.4 Two Frequency Driving of PMLCDs. 13 Passive Matrix Addressing of Bistable Displays. 13.1 Addressing of Ferroelectric LCDs. 13.2 Addressing of Chiral Nematic Liquid Crystal Displays. 14 Addressing of Liquid Crystal Displays with a-Si Thin Film Transistors (a-Si-TFTs). 14.1 Properties of a-Si Thin Film Transistors. 14.2 Static Operation of TFTs in an LCD. 14.3 The Dynamics of Switching by TFTs. 14.4 Bias-Temperature Stress Test of TFTs. 14.6 The Entire Addressing System. 14.7 Layouts of Pixels with TFT Switches. 14.8 Fabrication Processes of a-Si TFTs. 14.9 Addressing of VA Displays. 14.11 The Optical Response of a VA Cell. 14.12 Reduction of the Optical Response Time by a Special Addressing Waveform. 15 Addressing of LCDs with Poly Si-TFTs. 15.1 Fabrication Steps for Top-Gate and Bottom-Gate Poly-Si TFTs. 15.2 Laser Crystallization by Scanning or Large Area Anneal. 15.3 Lightly Doped Drains for Poly-Si TFTs. 15.4 The Kink Effect and its Suppression. 15.5 Circuits with Poly-Si TFTs. 16 Liquid Crystal on Silicon Displays. 16.1 Fabrication of LCOS with DRAM-Type Analog Addressing. 16.2 SRAM-Type Digital Addressing of LCOS. 16.3 Microdisplays Using LCOS Technology. 17 Addressing of Liquid Crystal Displays with Metal-Insulator-Metal Pixel Switches. 18 Addressing of LCDs with Two-Terminal Devices and Optical, Plasma, Laser and e-beam Techniques. 19 Components of LCD Cells. 19.1 Additive Colours Generated by Absorptive Photosensitive Pigmented Colour Filters. 19.2 Additive and Subtractive Colours Generated by Reflective Dichroic Colour Filters. 19.3 Colour Generation by Three Stacked Displays. 20 Projectors with Liquid Crystal Light Valves. 20.1 Single Transmissive Light Valve Systems. 20.2 Systems with Three Light Valves. 20.3 Projectors with Two LC Light Valves. 20.4 A Rear Projector with One or Three Light Valves. 20.5 A Projector with Three Optically Addressed Light Valves. 21 Liquid Crystal Displays with Plastic Substrates. 21.1 Advantages of Plastic Substrates. 21.2 Plastic Substrates and their Properties. 21.3 Barrier Layers for Plastic Substrates. 21.4 Thermo-Mechanical Problems with Plastics. 21.5 Fabrication of TFTs and MIMs at low Process Temperatures. 21.6 Transfer of High Temerature Fabricated AMLCDs to a Flexible Substrate. 22 Printing of Layers for LC-Cells. 22.2 Surface Properties for Printing. 22.3 Printing of Components for Displays. 22.4 Cell Building by Lamination. Appendix 1: Formats of Flat Panel Displays. Appendix 2: Optical Units of Displays. Appendix 3: Properties of Polarized Light.